I'm sorry to sound so harsh, but I just don't look to Macy's as the source for finding good design. It's one of those stores that I dash into for something that I really need (usually at the cosmetics counter) and then run for the door feeling very glad the moment fresh air hits my face. I dislike the entire store experience and find it all quite painful. That being said, I have to thank them for offering $699 sofas. And that I no longer have to endure physical pain to shop in their depressing store because they now have an online furniture store. Thank you Macy's. So decor8 readers, if you'd like a deal or two, this Corona sofa is a terrific find (and on sale) for $699 and starting tomorrow (Aug 2), will be available in pear, stone, and a very dark chocolate. You can even purchase the coordinating Corona chair for $539. Yup. Steal of the century. I'm not saying anything about quality, but based on looks, these sofas are a great deal and look a lot like their more expensive cousins in the cool stores. Frankly, unless you plan on keeping it for 30 years, sleeping on it daily, or jumping up and down on it like a nut, I'm sure one of these will last you until you get sick of it anyway. 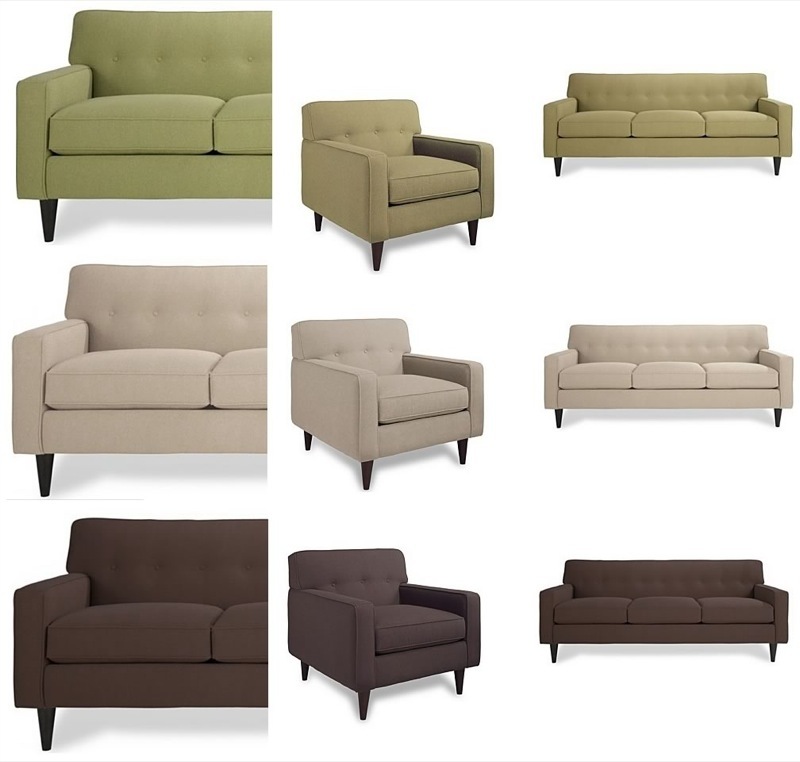 Here's a few additional $699 sofas, including a yummy steal in chocolate velvet called Tyler. Note: It looks like a shorty in the picture, but it's actually 82" wide. 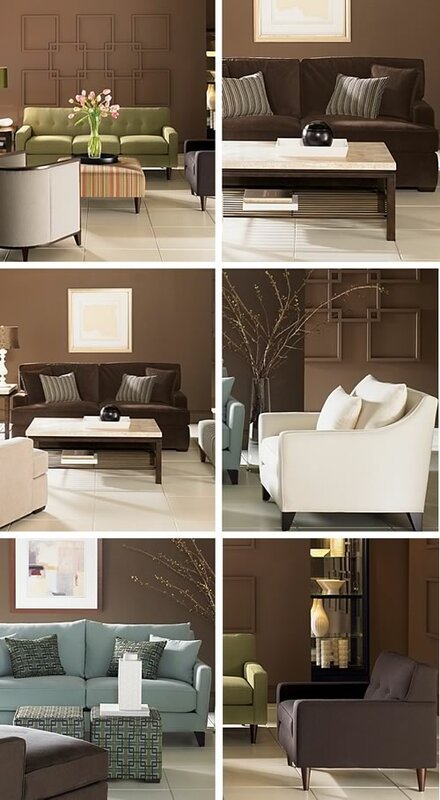 The Margaret chair for $549 is another great value and I really like the lines and that it's available in brown, cream, and blue. Very nice. 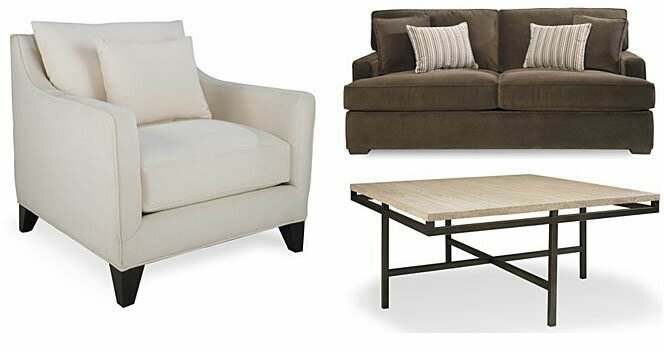 The East Park Square coffee table (there's a matching end table as well but I don't match my coffee tables to my end tables, so I wouldn't be into this) with a generous square travertine top and steel base is very sleek for $499. It looks like something you'd see in Elle Decor magazine in some tricked out space. I love finding great deals that look like you spent a fortune. And I don't know if you've noticed, but I see a modular seating trend coming on for Fall/Winter '07. Sectionals are hot. I'm not sure why, but all of the sudden they're everywhere - magazines, showrooms, catalogs. They are the new foo dogs, I guess. Just a whole heck of a lot larger, so unless you have the space, step away from the sectionals.